A couple of years ago a got a call from a friend of mine, with a problem. He is very much interested in birds, especially sea-birds, but unfortunately he is also the kind of person who can get seasick just watching The Deadliest Catch on the Discovery Channel. So he asked me if I knew of any place in the world where it was possible to do a decent spot of sea-bird watching from land. I told him in no uncertain terms to buy a ticket to New Zealand, and told him about various good spots. That's nice, I hear you cry, but where does the cryptozoological bits come in??? He took off in november 2008, and soon I was experiencing a deluge of postcards, mails and phone calls from him, ranting and raving about petrels, shearwaters and albatrosses. All very nice, but nothing out of the ordinary, apart from one very interesting sighting. On December 6th 2008 he was birdwatching close to Kaikoura. The weather was filthy, rainy and windy, but a lot of the good stuff was coming in close to shore, among them several albatrosses - two phantastic royals and a wandering, and several smaller individuals of other species - and one of those was pale blue. Now he knew, and I knew, that we have several grey albatross species, and these could maybe look blue under certain circumstances. Except for the fact, that he saw the bird with several others, among those a couple of grey birds, and he insists, that this rather special looking thing was blue. A blue albatros?? A marking experiment perhaps? No, my friend said, it was uniformly pale blue all over. A genetic abberation? Perhaps - or perhaps even a new species. I have no idea - my friend did not have a camera, so no pictures. But since then I have collected two other sightings of blue albatrosses in New Zealand waters, one from the outer end of Milford Sound in 2007, and another one from the Cook Strait in 2010. It could be three different birds - it might even be the same one. 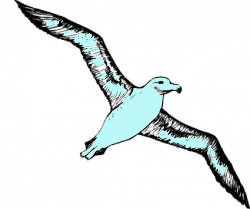 I don't know - but please keep an eye out for a blue albatross, and if you get af picture - send me a copy!